Downdrift by Johanna Drucker is a book that amazed and delighted me, even though as a cohesive narrative it fails completely. Fail is the wrong word, though, for a goal that is never attempted. This novel doesn’t want to be judged for its storytelling, and it is not so much a novel as it is a sometimes-whimsical, sometimes-serious thought collage. The story is narrated throughout by “Archaeon,” a unicellular organism that belongs to the Kingdom Archaea, a creature that has (through contact with others of its kind) absolute knowledge of events the whole world over, but that has almost no sense of narrative suspense. Our time scales–yours and mine–are as different as our size and complexity. To me, all of the follies of the animal kingdom are the trivial business of a few seconds of my historical memory. Nearly three-quarters of the earth’s existence has passed in my presence, billions of years. Compare that to the mere millions in which primitive arthropods and other organisms came into being. And you? A blip on the screen, a tweak in the evolutionary chain, a phenomenon of rapid acceleration. I will long outlive you and the changes wrought on this world by your machinations. 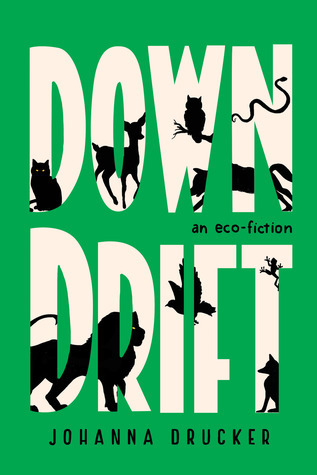 What forward narrative momentum there is in Downdrift (and it barely registered with me as I read along) hangs on the stories of a lost cat and a peripatetic lion, creatures that re-appear at intervals in the story, and that seem destined to meet at some point. And they do meet. But that meeting seems beside the point when it happens, because the real delight of Downdrift is not in narrative at all, but in an accumulation of detail, sentence after sentence, that by the end paints a picture of vast ecological disruption. Another round of salamander antics is taking place in the autumn woods. A big group outing, comprised of extended families and pseudo-families, is underway at the edges of a pool. They have collected food bright as their red bellies or the stark yellow of their spots. The older ones are picking at a few, very few, highly colored bits of fungus and mixing them with all manner of beetles and flies, worms and larvae, spiders and moths and grasshoppers to make a banquet from an ancient recipe. These traditions may also soon be at risk, but not yet. In a brave choice on the author’s part Homo sapiens barely signifies in this novel at all. At one point coyotes are stealing human babies; at another point Archaeon wryly observes “an outbreak of human shoaling, seepage into the homo sapiens from the minnows and sardines,” an image that carries with it both the idea of humans under stress, as well as the lack of significance that humans and their problems have to this story. Because this is not the human’s story. The subtitle to Downdrift is “an eco-fiction,” and the novel fulfills the goals of this relatively new genre in a significant way. The novel is a metaphor for the way we value convenience over preservation; the way we prioritize the artificial over the natural; the way we focus on our daily worries rather than the long-term problem of potential ecological collapse. For those who have the willingness to let the a story flow past at its own pace, the novel offers a unique and thought-provoking take on the world and our place in it. Some books leave me speechless at the end. I mean this quite literally. I’m not making a metaphorical “there are no words” comment about the quality of what I have just read. I am instead trying to report a physical phenomenon, a feeling in my throat and lungs that comes only rarely, just after a last sentence is read, and a book is closed, when I’m left with a dazzling void of complicated feeling that renders me mute. After a while the words come back, and my feelings about the book begin to shape themselves into language. 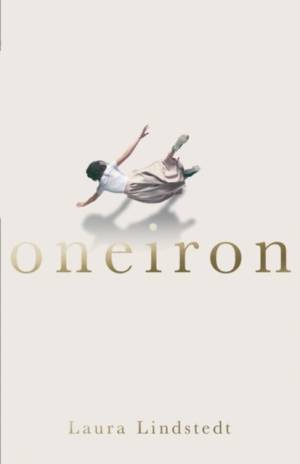 So here is this novel, Oneiron*. In it seven dead women find themselves together in a placeless place, a white void with only the clothes on their backs. At some point they notice they aren’t breathing. Not long after, they realize they are dead. They share their stories. They help one another. They bear witness to the one another’s final moments. These seven women are remarkable only in the way that every human being is remarkable. The stories of their final moments before death are haphazard and sometimes violent and always meaningless. The women have nothing in common, not even a common language. But even so these women make themselves into a caring community, in this strange afterlife, where nothing is ever explained, either to these seven characters, or to the reader. As in real life, the characters, and through them the reader, need to take it on faith that their experiences have purpose. Oneiron is not a religious book. God has no place in the afterlife Lindstedt creates. I’m not a religious person. Yet somehow this novel embraces a life philosophy that reminded me of Paul’s teaching. The novel suggests that caring for others–even in the flawed ways these strangers reach out and care for one another after death–is the most vital motivating impulse that gives meaning to our lives. A while ago I wrote about three novels that I called “the most truthful, most political novels I’ve read” for some time: “Preparation for the Next Life by Atticus Lish, The Sarah Book by Scott McLachlan, and Blood of the Dawn by Claudia Salazar Jiménez. 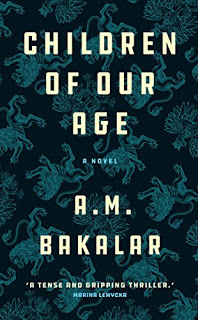 To that list of highly recommended reads I’d like to add Children of Our Age by A.M. Bakalar. What a book. Where Lish in Preparation for the Next Life wrote about the way undocumented workers are ruthlessly exploited by others, Bakalar’s focus is on those who would exploit them. Her characters are Polish immigrants to London who have just barely managed to scrabble up to a precarious but undeniably middle-class way of life. Their success has many times come at the cost of their humanity: those who have learned to traffic humans, and to treat human beings with the same level of detachment as they would livestock, are the ones who, at least at the beginning of this harrowing novel, are most likely to succeed. 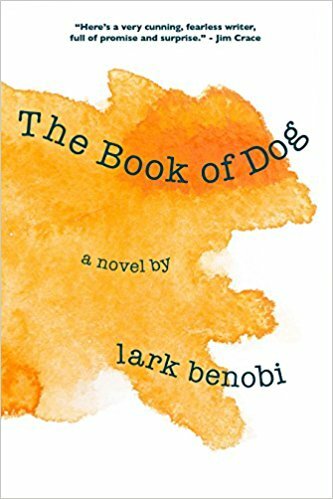 What makes this novel great is the way Bakalar manages to create empathy for all of her characters, even the most ruthless and damaged of them. For example Bakalar writes a scene in which a thuggish violent man stalks, rapes, and strangles a sixteen year old girl. It’s a scene every bit as harrowing as Joyce Carol Oates at her disturbing best, but then, in a surprising coda, Bakalar lifted me out of a knee-jerk repulsion for this character, and left me instead with a feeling of empathy and sadness for what this man had endured in life. Time after time I was plunged into a sense of compassionate understanding for characters that behave in selfish and disturbing ways. It’s quite a ride. The novel offers no easy answers. A lot of bad things happen. 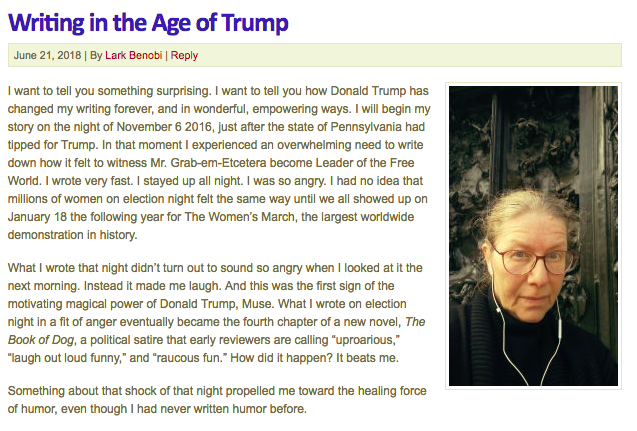 And yet somehow I finished feeling compassionate and hopeful. Some novels perform the important work of shedding light on the ways economic inequality corrodes human endeavor, even in relatively well-off societies. Politically-oriented social realism, with a focus on the working poor, has not been a wildly trendy type of novel for some time, and that’s too bad, because this kind of fiction provides a way into the lives of others, and it’s the kind of understanding we can use more of just now. 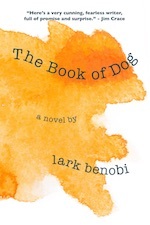 Wow, I just realized I have more reviews on Goodreads for The Book of Dog by Lark Benobi than I do for my first novel, After by Claire Tristram…even though my first novel was reviewed in NYT and Entertainment Weekly and People, and even in Andy Warhol’s Interview, while the new novel is solely word-of-mouth. I feel very grateful to my friends and fellow readers on Goodreads for giving this new novel a chance. Thank you.